Red Deer’s Most Fatal Attraction will be opening its doors Oct. 18th to stir up a scare during this year’s Halloween season. Put on by Youth HQ, this year marks the 27th annual edition with 100% of the proceeds going to support the Boys and Girls Club of Red Deer. “The theme this year is Lost Souls,” said John Johnston, fund development manager with Youth HQ. The theme is a salute to those movie characters who like to terrorize children at Halloween, he added. It took an army of volunteers to make the haunted house happen. They’ve been busy since Oct. 2nd spending countless hours setting up the attraction and engaged in character role training sessions. More than 40 business friends helped make the event possible, along with numerous returning sponsors. Johnston said the community feedback over the years has been fantastic. “It’s become an event everybody looks forward to every year. We’re averaging over 7,000 people a year who come through the event,” he said. Last year, more than $100,000 was raised for the Boys and Girls Club. He said all of their programs are at no cost and go towards the children attending, and they rely upon this fundraiser to keep making the programs possible for those children. 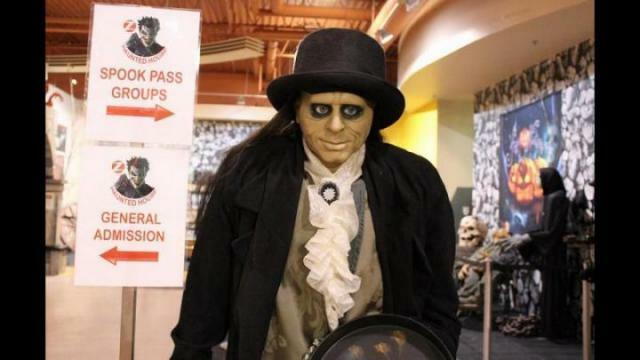 The haunted house runs from Oct. 18th to Oct. 31st from 6 p.m. to 10 p.m. each evening at Parkland Mall (the northeast mall entrance beside Goodlife Fitness). The event also offers afternoon matinees, which are geared toward children under 10 years of age on weekends from 1 p.m. to 4 p.m.
“The evening show is not recommended for children under 10 years of age,” said Johnston, adding the matinees won’t have a lot of the big scares or gory areas activated. On Oct. 20th, there will be a Freaky Friday event, where people will have the opportunity to meet some of the houses’ premiere 2017 headline feature characters from 7 p.m. to 9 p.m. Free photo opportunities will be available. There will also be a Date Night option available on Oct. 21st for those wanting to experience a personal tour with their special someone. That will take place from 7 p.m. to 9 p.m., and no other groups will be on the tour with you as you experience scares up close and personal. Wicked Wednesday will take place Oct. 25th for those to have a chance to meet the cast up close and personal from 7 p.m. to 9 p.m. Midnight Madness will take place on Oct. 27th for those individuals who want some more intense scares than the regular evening show. Once the evening show closes at 10 p.m., the doors will re-open at midnight for two hours. “That’s strictly for 18 and over only, and it’s quite intense that night,” said Johnston. Friday Fright Night will take place Oct. 27th from 7 p.m. to 9 p.m., which will allow the public to watch youth dancers from Dancers Edge Studio in Blackfalds performing their annual March of the Zombies outside the main entrance. Saturday Spooktacular will take place Oct. 28th from 7 p.m. to 9 p.m. where members of the public can come dressed in costumes for a chance to win some great prizes. Parkland Mall Fright Night will take place on the final day, Oct. 31st for children to enjoy a child friendly matinee from 4 p.m. to 5:30 p.m. at a reduced admission. For more information on the event visit http://youthhq.ca/events/item/2016/zed-haunted-house/.